AUSTIN, TX – Texas’ voter ID law, passed by the Republican-controlled state legislature and widely condemned as discriminatory and unconstitutional, now has a day in court. Judge Nelva Gonzales Ramos of the U.S. 347th District Court, chose September 2, 2014 to hear the case in Corpus Christi. This date falls just over a month before the pivotal 2014 statewide elections. The Voter ID law, officially known as Senate Bill 14, has been the target of numerous lawsuits. On November 12th, a South Texas plaintiff group comprised of African American and Latino voters filed a claim under the authority of the 14th and 15th Amendments of the U.S. Constitution, while the U.S. Department of Justice filed its own claim back in August. Critics of the law regard it as a blatant effort to disenfranchise large segments of the voting population, especially low-income and minority voters who traditionally vote against the conservative bloc that pushed Senate Bill 14 through. Proponents of the law cite a desire to limit voter fraud. According to the Dallas Morning News, the law would have prevented exactly four fraudulent votes cast statewide since 2004. In 2012, the New York Times publicized a study that determined voter ID laws cause a two percent drop in turnout among registered voters. In Texas this works out to 279,924 voters dissuaded from the polls of every election. State Attorney General and gubernatorial candidate Greg Abbott, a major proponent of the ID law, cited the instance of a woman who mailed in five absentee ballots for a 2012 primary as proof of its necessity. Mr. Abbott made this statement in apparent ignorance of the fact that the voter ID law has no bearing upon absentee voters. The U.S. Justice Department suit against the law explicitly compares it to the poll taxes and literacy tests enforced during the Jim Crow era. In 2012, Attorney General Eric Holder announced that 25 percent of African-Americans lack the type of ID required compared to eight percent of whites. In Texas, 1.4 million voters overall lack the necessary ID. The voter ID law generated headlines earlier this month when public figures like Judge Sandra Watts, State Senator Wendy Davis, and former U.S. Speaker of the House Jim Wright were initially refused the right to vote due to problems with their IDs. 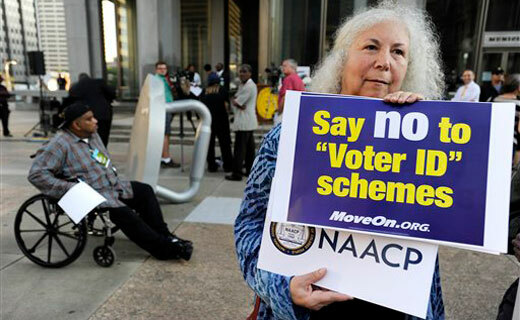 Opponents of the law pushed for the early September hearing in the hope that voter ID requirements get struck down before the November 2014 elections.